What Is The Difference Between Septic Tanks And Sewer Services? Now that the plumbing has been installed, inspected and is being sealed behind the drywall, the plumbers return to connect the sewage and water lines to the city's service. The dug a trench from the hookups on the side of the house to the service area. Several clean outs for the sewage, and external disconnects for the water service are also installed for convenience. 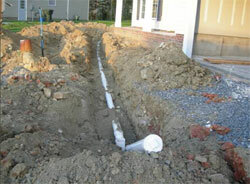 The sewage pipe is the same PVC pipe used in the drain system of the house and the water line is the same PEX material used through the home. Basically, a septic system is a stand-alone water disposal system which, when installed, is capable of treating solid and water waste coming from a residential home connected to it. Meanwhile, a sewer service is a paid service offered by the municipality or city to treat solid and water waste coming from several residential and commercial establishments. Septic systems and sewer services are both excellent water disposal solutions widely used in the country, but are often misconstrued. What are their major differences? Septic tanks, unlike public sewer systems, require an awful lot of ground space. For this reason, septic tanks are commonly found in suburbs and rural areas where residential or commercial properties include spacious yards. Apartments and houses in crowded cities have public sewer systems available to connect. Since private individuals own septic tanks, they are mainly responsible for the maintenance. Although septic tanks work well on their own, owners must check their systems from time to time just to make sure there is no clogging, leaks, or overflow. As an owner of a septic system, you also want to make sure that the natural decomposition inside the tank is gliding at a normal pace to avoid clogging and overstuffing. Make sure that only water and toilet water goes in to the system and not oils, bleaches, and other heavy chemicals, which may wipe out the good bacteria in your tank. In case harmful elements enter your tank, there are commercially available products to undo this potentially harmful damage. On the other hand, homeowners who use sewer services enjoy freedom from virtually all maintenance and repair work. Basically, it's the municipality or city who handles all the necessary actions to keep the sewer systems working. Depending on their schedule, employees may visit your house once every one or two a year for inspection and periodic cleaning. Septic tanks do not require monthly maintenance or repair so cost is not really a burden. Septic tanks usually operate without trouble and last for a long time before requiring any pumping, repair, upgrade, or major overhaul. Sewer systems are work-free but owners have to pay a fee to the municipality or city for the sewer services they provide. The fee is based mostly on the total water usage of the household and other labor-related expenses monthly. In the long run, sewer systems will prove costlier than septic tanks. Sewer systems generally operate seamlessly and threats to health and safety are no issues anymore. Septic tanks, on the other hand, need to abide by the regulations set by the city or municipality health and sanitation codes. For septic tanks, the first major rule is to keep it as far away as possible from your fresh water supply. The law specifically states that no septic tank can be built adjacently or on the same area where the well or fresh water supply sits. By placing the septic tank on the opposite end, the occurrence of certain water-borne diseases such as e-coli and dysentery may be prevented. Often, these illnesses break out when disruption, pipe bursts and leaks, and other problems with the drainage system occurs. To safeguard you family from water contamination, have your water tested every two years. Thankfully, both waste disposal systems work well with the environment. They treat the wastes systematically and send back the nutrients and usable water to the earth, which in turn, uses it to nourish plants and other living organisms living on it. Researching both systems will be beneficial, however, in most cases, the homeowner does not choose which system they will use. It all depends on where you live, if your town, city or village provides public sewer, you will most likely connect to that. If you are in an area where this service is not provided, you will need to have a professional come in to build the appropriate septic system for your home.